Show your support and increase awareness with our Epilepsy Awareness Can Wrap Koozie. Our Awareness Koozies are great for encouraging health and wellness along with educating and showing support for those fighting for a cure. Also makes an excellent accessory for any upcoming Walk for Epilepsy Event you may be joining. 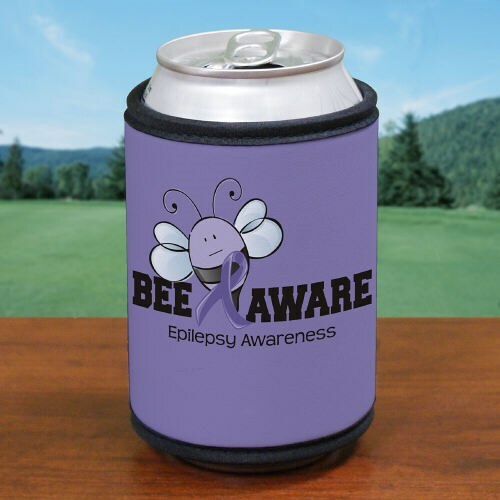 Your Epilepsy Can Cooler Koozie measures 4" x 9 1/2" with Velcro closure around your beverage bottle or can. Each Awareness Koozie shows your continued support in funding research and makes the best Personalized Epilepsy Walk Event Accessory. This Epilepsy Awareness Ribbon Koozie also looks great with our Epilepsy Awareness Water Bottle and our Epilepsy Awareness Tote Bag. For every purchase made, MyWalkGear.com will donate a portion of its proceeds to help people and families living with this condition.